The scene depicts the graceful figure of Asoka's Queen standing in front of the railings of the Buddhist monument at Sanchi built during the reign of her husband King Asoka. The print is based on an original painting held in the Royal Collection at Windsor Castle. 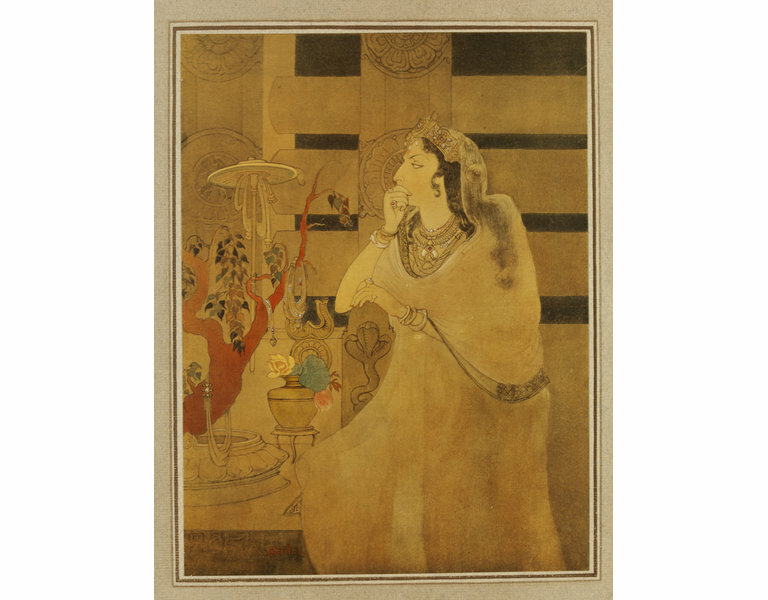 Abanindranath Tagore (1871-1951) was the pioneer and leading exponent of the Bengal School of Art. In his paintings, he sought to counter the influence of Western art as taught in art schools under the British Raj, by modernizing indigenous Moghul and Rajput traditions. His work became so influential that it was eventually accepted and regarded as a national Indian style. Reproduction of a watercolour, this image depicts the graceful figure of Asoka's Queen standing in front of the railings of the Buddhist monument at Sanchi, built during the reign of her husband King Asoka. The chromoxylograph was probably printed in Japan from wood-blocks. Bengali signature on left hand corner. On reverse see Indian Society of Oriental Art, Calcutta stamp. The print is based on an original painting held in the Royal Collection at Windsor Castle. 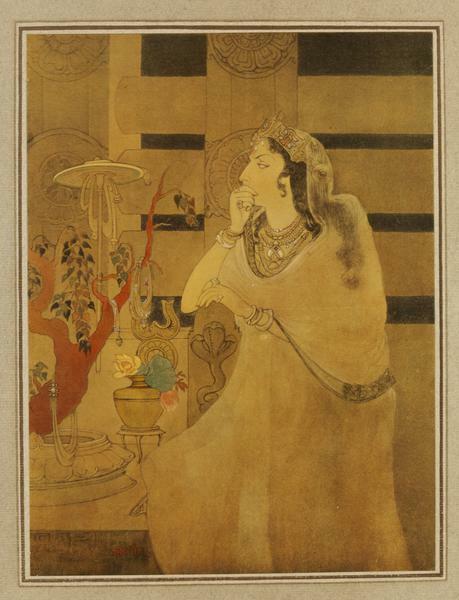 In his work, Abanindranath retrieved themes from the Indian epic past or scenes from romantic tales, such as Arabian Nights or Omar Khaiyam and reworked them in a highly romanticised style. The artist’s desire to emancipate Indian art from European influence was also fostered by Japanese artist Okakura Kakuzo, who visited him in 1902. Later, studying Japanese art under Japanese artists, Taikoan and Hilsida, Abanindranath assimilated Far Eastern techniques such as the wash into his work. His Omar Khaiyam series (1906-08) reflects such influences. 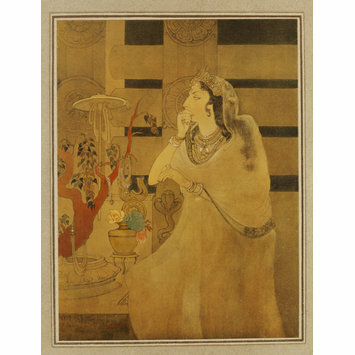 Abanindranath’s use of colour was also highly personalized and found its appropriate language in two major techniques: wash and tempera.